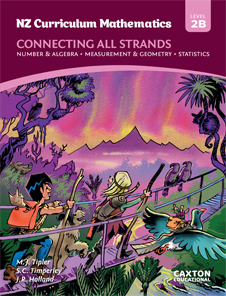 Level 2B Student Resource NZ Maths Book from CaxEd works in partnership with Level 2A and fully covers all of the New Zealand Level 3 curriculum achievement objectives. all strands of the latest New Zealand Curriculum Mathematics. the Number and Algebra strand wherever possible. There are two NZ Maths books to cover each of levels 2, 3 and 4 of the curriculum. Book A covers the earlier part of each level and Book B covers the later part. Extensive mappings from the curriculum to the book to guide your planning. Rich tasks to engage students and groups in mathematics. These can be used for independent or group work, homework or as an extension. Questions that build confidence, encourage mathematical thinking and enhance mathematical communication. Enough material so that you can choose the best combination of work to study. Comprehensive coverage of the curriculum. LEVEL 4A STUDENT RESOURCE BOOK IS AVAILABLE NOW, CLICK HERE TO PURCHASE. LEVEL 4B STUDENT RESOURCE BOOK IS AVAILABLE NOW, CLICK HERE TO PURCHASE. LEVEL 3A STUDENT RESOURCE BOOK IS AVAILABLE NOW. CLICK HERE TO PURCHASE. LEVEL 3B STUDENT RESOURCE BOOK IS AVAILABLE NOW. CLICK HERE TO PURCHASE.